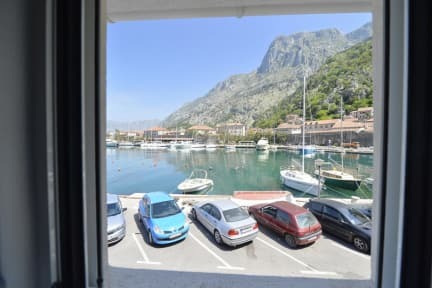 Pupa Hostel i Kotor, Montenegro: Bestill nå! This property is next to the old town and 5 meters from the sea. 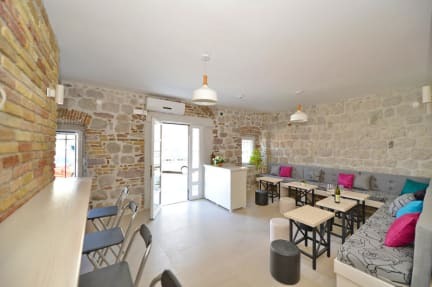 This hostel is located in a stone building that is 150 years old and has been totally renovated this year(2017). The hostel has 6 large rooms with 2 lounge areas and 2 large shared bathrooms . In all of our rooms we have bunk beds. All rooms are equipped with free air condition and free Wi-Fi throughout the hostel itself. The area around the hostel is very quiet, peaceful and vivid. In our immediate vicinity you can find 6 restaurants (Fish, Grill , General restaurants etc.) and the nearest one has the highest rate on TripAdvisor. The view from our hostel overlooks the entire city walls and the top of the mountain of St.John. Cancellation policy: 72h before arrival and no show will result full amount of stay. Payment upon arrival by cash or by credit card.